This is my first post of many. I inherited my father's workshop full of tools, emco lathe, burke no. 4 horizontal mill, rockwell bandsaw, rockwell delta unisaw, and few other pieces. Except for the lathe, all other tools are in various stages of project completion status. Right now I want to get the saw going. It came with a 3ph baldor bullet motor, and my father bought a used but in great shape rockwell 1ph 230V 3hp motor for his house wiring. I have gathered all the parts I could find, and it appears that I have everything together except for the controls and wiring. I'm a civil engineer and former 6th period union apprentice carpenter, good with tools, auto engine building, 12v boat wiring & electronics, but my electrical knowledge of electric service wiring is very limited. I have a cutler-hammer manual nema size 0 motor 3ph starter that I assume came with the saw, photos of starter and motor attached. Can I use this starter, or do I need something else. I will most likely not be doing anything heavy with the saw, probably some cabinetry, and some boat related starboard poly board fishing storage. I wrote an ebay vendor selling a magnetic starter assembly and he called be back and was generous with his time, this was before I found the manual starter switch, and he said many people in residential applications just use a normal switch and use a low amp circuit breaker at the main panel, in this case maybe a 12.5 amp one. If possible I would like to use the cutler-hammer one because it's heavy duty and offers overload protection, I found out that the unisaw motors are costly and I don't want to fry this one or get hurt. Thanks for your time and I look forward to participating. I would start with finding a Unisaw manual showing wiring diagram and parts for a single-phase (220) version of that saw. That should be readily available. The Cutler Hammer I'd take a second look at. The arcing visible on the green button's metal plate -- one wonders if that's from an errant wire strand, or a failure of some kind. Can't really tell from here, but there's little to lose by buying whatever part is the current offering for single-phase use. You may find it's a nicer switch, possibly with a safety interlock and a big ol' stop paddle, as is the fashion. A magnetic switch is good to, as it avoids unintended/unsupervised re-starts if you blow the main breaker, and walk away to attend to the breaker without actually turning off the switch. The cat will thank you. 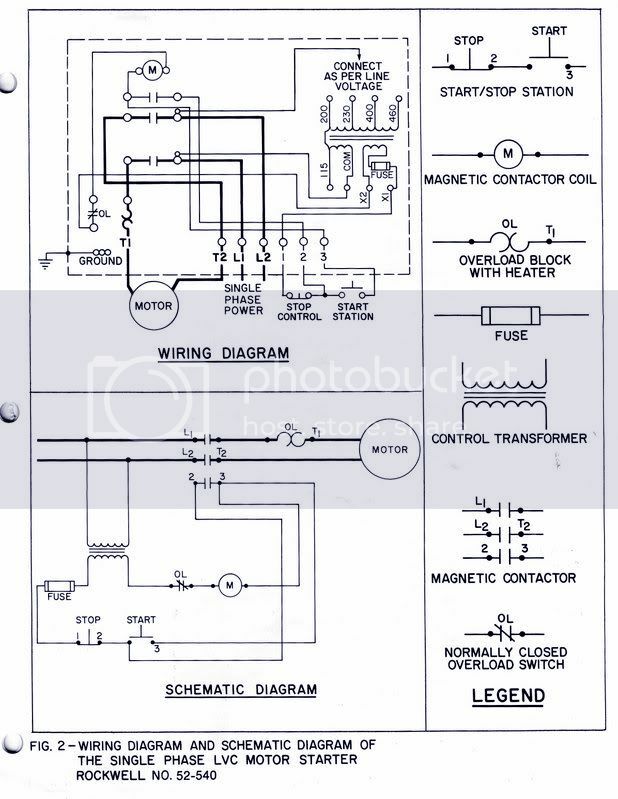 Your 5th photo shows a wiring diagram. This is a "Manual Starter", and the start and stop buttons actuate mechanical mechanisms to close/open the motor contacts. The "overload relay" note on that label indicates that the L2-T2 power path has the heater (that coil looking part) being removed and shorted with a jumper for single phase operation (this will probably be a no connect, unless you have some other signal you want opened if the overload trips so ignore this power path). You will need to locate the correct heaters for the motor nameplate current of 15.5 amps as I doubt if the 3 phase heaters are correct for this current. The chart for the heaters part number appears to be on the inside cover. See if you can find the heaters for the 15.5 amp off eBay. But searching for a heater chart, shows that part numbers H1040/H1041 is used for 15.5 amp for several C-H models (use your chart to find the correct heater for this starter). The existing heaters are H1034 which is for 7 to 9 amp operation. It should be simple wiring from input power to the L1 and L3 line input. Then connect the motor to the T1 T3 terminals (you can use any 2 of these power paths, me I would use the L1-L2 to T1-T2 for single phase). Then just ensure the safety ground is connected to the saw chassis and to the motor housing. Thanks Chip, good advice. I'm going with the new heaters using the manual switch to make sure the the motor runs, 10 bucks on ebay, and keep my eye out for a magnetic starter. Thanks ignator, found 2 new shipped for 10.99, I'll try it out. I like the idea of the magnetic starter and will keep an eye out for one in the future, but this will get me started. Now I need to buy some power cable. The magic smoke got out of my Unisaw motor a few years back. Damn near killed me getting it out, and then back in after I had it refilled. Those things are heavy! You hide your magic smoke in a table saw? It would get mixed with sawdust! It may be cheaper to find a complete used adjustable overload/contactor rather then buy two heaters. Just make sure that the adjustment is in the range you need. make sure that the coil voltage is something you can use. I try to always provide a neutral so I have 120V available for an 120V outlet on the machine. Of course that also allows 120 or 240 volt coils. I am told that 208V coils will work fine on 240? Interesting, what are the pins out on the top of this device, are they made to plug into another component? That picture is one I found with a quick search and used to show the adjustable part. The unit shown is just the overloads. Like a circuit breaker. It is designed to plug into a contactor(relay) that would normally switch the power on and off. when they add the overloads to a contactor they call the combination a "motor starter" The overloads only turn off if the current draw is too high. In normal operation they never disconnect. As they turn off they also disconnect the power to the coil so the power is turned off in two places. All three phases are monitored and inter-tied so that if one trips out it mechanically trips off the two other phases at the same time. They normally include a forth, low power, switch, also inter tied, which is used to switch the control voltages. I went to college in the 60s. You think it mattered? (If you can remember the 60s, you weren't really there...). What is wrong with a simple heavy duty toggle switch? I bought my Unisaw 55 years ago brand new with a single phase motor and used it for years in my cabinet shop, still have it and use it all the time. It came factory with a simple heavy duty toggle switch which I had to replace about 8 years ago. Replaced with a similar switch from Mc Master-Carr and still going strong. I found one of those too, and old new in box square d one, in case the culter hammer switch doesn't work i'll iwre that one in, thanks. If you run a contactor it makes it easy to add multiple stop switches. On my planer I have one on the front and back sides. I just have a start switch in front, no need for more then one of those. A stop switch on the side/back might be good on a table saw. When I rebuilt my Unisaw about 10 years ago, I installed a new 3hp motor and magnetic switch. The magnetic switch has a safety factor built in since they typically have a large stop button, and the fact that the saw won't restart automatically in the event of a power outage. I just looked on eBay and they are about $110.00. (just search for "magnetic table saw switch". On my switch, I installed a 3" x 5" hinged paddle in front of the stop switch. I can easily turn the saw off with my leg if needed, but it just makes it easier on a daily basis to reach to the general area and slap the switch to stop the saw.